I’m not sure why but I’m super into Valentine’s Day this year. Not in the mushy, cheesy way but in a more fun, “let’s decorate” and make it a little special way. This time of year tends to be tough with all the cold and gloomy days so I’m happy to take a little excuse to add some color and make an event out of it. I got started on this last week when I ordered these matching pajamas for the boys, as well as the little “heartbreaker” buttondown for Jackson and “Little Guy, Big Heart” tee for Dylan. 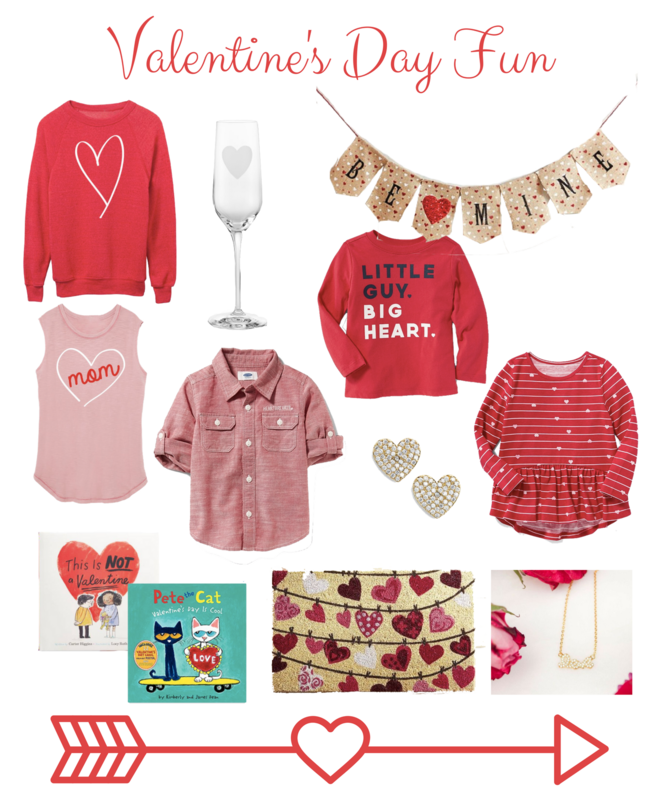 Old Navy has a lot of cute things for Valentine’s Day right now and the prices were all really good too! I’m going to do a little decorating around here and I picked up this little banner to hang in our breakfast room along with some little decorations I have from last year’s project with Meijer. I will also inevitably order a slew of window stickies for the boys. My mother-in-law started buying these for them and they freaking love these things! I love that I can give a pack to each of them, assign them a (separate) window and they’re very, very occupied for at least 30 minutes. Kind of amazing, I highly recommend it. It isn’t a holiday around here without new books, so I think our Valentine’s gift to the boys will be a new book for each of them. Dylan is into “Pete Cat” right now, and of course Pete has a Valentine’s Day book. Jackson fancies himself an expert joke teller so I found this Valentine’s Day Jokes for Kids book on Amazon and will probably grab that for him. What about you all? Are you ready to get into another holiday yet?